During the reign of Edward IV, son of Henry VIII, the Latin used in church was replaced by English. This was of no use to the Welsh people, since they understood English no better than Latin. But when Elizabeth came to the throne, she knew how important it was to keep the Welsh happy, and an Act of Parliament was passed in 1563 to allow the translation of the Bible and the Book of Common Prayer into Welsh. 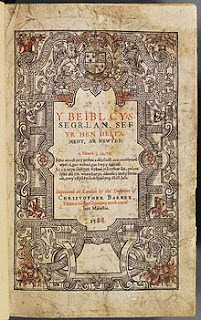 The first translations of the New Testament and the Book of Common Prayer were done by William Salesbury, a Welsh lawyer from Denbigh who had studied at Oxford. They were published in 1567, but the Welsh didn’t like the stilted language and odd style. The Old Testament was never translated, and Salesbury died in 1584. William Morgan from Nant Conwy studied at Cambridge and became the vicar of Llanrhaeadr-ym-Mochnant in 1578. He determined to produce a better translation. He was helped by the scholar John Davies and the poet Edmwnd Prys, and the work was supported by Archbishop Whitgift. The translation of the whole Bible took ten years and was published in 1588. Dr Morgan later became Bishop of Llandaff and St Asaph. 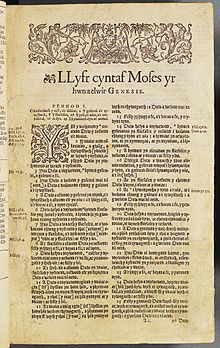 In September, 1588, the Privy Council ordered for a copy of the Welsh Bible to be sent to every parish in Wales at a cost of £1 per copy. The translation of the Book of Common Prayer was published in 1599 and was in fact, William Morgan’s final legacy. He died in 1604. He also began work on a revision of the 1588 Bible, which contained a number of printing errors. This work was continued after Morgan's death by Bishop Richard Parry and Dr John Davies, and a revised version of the Bible was published in 1620. This edition is still known as William Morgan's translation, and it is this rather than the previous edition which became the standard Welsh Bible until the 20th century and continues to be used to this day.